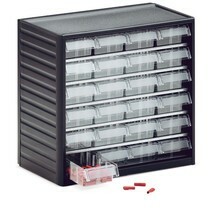 Use the Premium small parts cabinet for the organised storage of small parts at workstations. The high-quality cabinet has a polypropylene frame, galvanised shelves and polystyrene drawers. With this revolving stand, you can stack small parts cabinets in a space-saving manner. 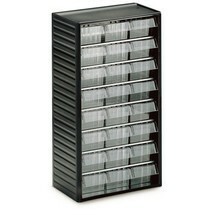 It offers capacity for 12 cabinets. With transverse partitions for small parts cabinets, you can configure the interior of cabinet drawers to your individual requirements. 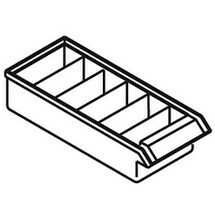 This allows you store related small parts of different sizes or types separately in the same drawer, ensuring they are always ready to hand.